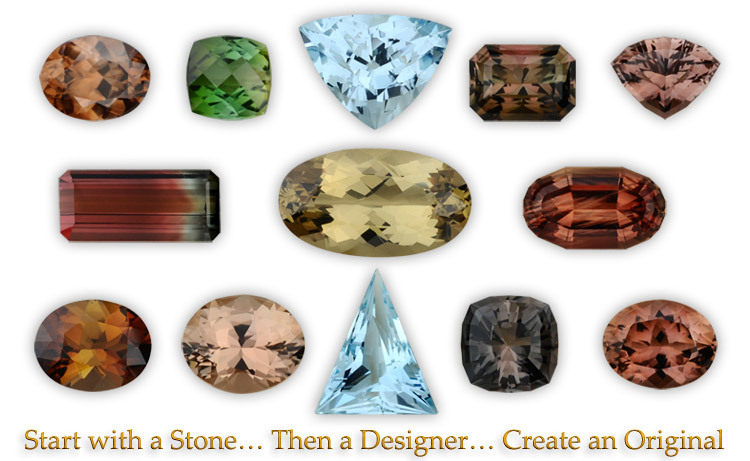 At Ivey Gemstones we have a passion for colored stones. Many of our lesser known gems have excellent characteristics for jewelry. We encourage Jewelry Designers and Retailers to inventory a selection of loose gems for the increasing number of buyers who wish to wear custom designs featuring unique and colorful gemstones. BERYL includes the following varieties: Emerald, the most famous beryl, is the green variety; Aquamarine (said to be worn by sailors to keep them safe and prevent sea sickness) is the second most famous and includes light blue, blue, and blue-green varieties; Golden Beryl occurs in lemon-yellow and golden-yellow colors and is sometimes synonymous with Heliodor; and Morganite (named in honor of the American banker and gemstone collector, J.P. Morgan) is the pink variety. There are also red and colorless varieties of beryl named Bixbite and Goshenite, respectively. Beryls are some of the most valuable of all colored gemstones. SPINEL is a gem most famous for its history of confusion with ruby. The famous Timur Ruby, now in the private collection of Queen Elizabeth II of England, is in fact a 352 carat spinel. Another famous spinel is the Black Prince Ruby and has been in possession of the British royal family since the 14th century. Spinel is found in the same locations as corundum and until the 19th century, before distinctions could be made through hardness and x-ray tests, it was often misidentified as ruby or sapphire. It should be noted however that natural spinel is never heated or treated by any other method, unlike most ruby and sapphire on the market today. In addition to red, spinels are found in pastel shades of pink and purple as well as blue. TOURMALINE has become a favorite among gem collectors. The Empress Dowager Tz'u Hsi, the last empress of China, loved pink tourmaline and bought large quantities for gemstones and carvings. Tourmaline has tremendous color variation and pleochroism, that is, when rotated the stone appears to be different colors. The most highly prized tourmalines are bi-color and parti-color (if more than two colors are present). Also, tourmaline provides the greatest selection of colors in any untreated gemstone. SUNSTONE is the state stone of Oregon where many of the finest specimans are mined. They have special optical properties that often give off a glittery effect caused by light moving across the stone. The highest quality sunstone can be faceted and set in rings, earrings and pendants. CITRINE is plentiful in nature therefore it is one of the most affordable of gemstones. It is a variety of quartz and can be found in shades ranging from pastel yellow to dark brownish orange. Citrine is known as the "healing quartz" and is very popular in jewelry. PERIDOT is a gemstone that forms deep inside the Earth and is brought to the surface by volcanic erruptions. It only occurs in shades of green and its color cannot be modified by any form of treatment. Legend says that some of the "emeralds" worn by Cleopatra were actually peridot. SAPPHIRE and ruby are two of the gem-varieties of the mineral corundum. Blue is the classic sapphire color however sapphire is found in a wide range of colors including yellow, pink, white, orange, green, purple, black, and parti-color. All other colors of sapphires other than blue are called fancy sapphires. SILLIMANITE is classified as a collector's gem. It is also known as fibrolite and is related to both andalusite and kyanite. Colors range from colorless to gray-white, green, yellowish, brownish and bluish. It is a rare gemstone that is not yet commonly used for jewelry, most likely due to the fact that most jewelers are not aware of it. Sillimanite is not known to be enhanced. TANZANITE was first discovered in 1967 in Tanzania, East Africa. It is often blue color when first mined but can also be brownish-yellow; it is routinely heat-treated to permanently draw out its exotic violet-blue color. Tiffany and Company were the first to market the new zoisite gems under the name tanzanite and since then this stone has greatly increased in popularity. It is considered rare since it is found in only one location, Merelani Hills, west of the majestic Mount Kilimanjaro. ZIRCON is found in a wide range of colors such as blue, yellow, orange, brown, green, colorless and red. Because of its high brilliance and dispersion, colorless zircon has been used as a substitute for diamond in jewelry.